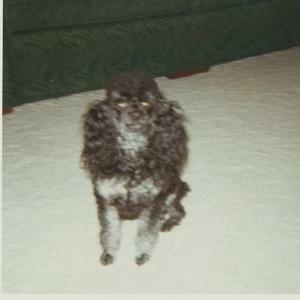 See Holly's toy poodle pictures, and meet the much loved inspiration for Poodle Pictures.com, a black toy poodle named Holiday Sunshine; Holly for short. 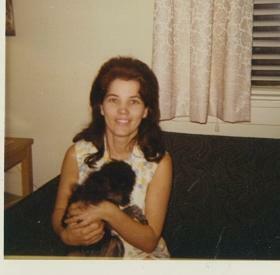 We hope you enjoy her, her stories and her toy poodle pictures. We wanted a poodle because they don't shed, in particular we wanted a female toy poodle. We found a local breeder, contacted her and went over to see the mother and black toy puppies about six weeks after they were born. 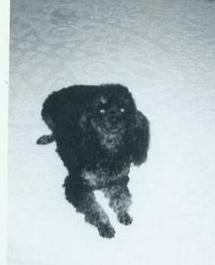 Holly was a black toy puppy with silver on her chest and paws. My mom liked the silver so that was the one we bought. She was named Holiday Sunshine and registered with the AKC. After having had goldfish and a bird named Moose as a pet, we didn't know too much about how to care for a puppy or toy poodle care. Holly knew her mama was the leader of the pack. Her mommy fed her and took care of her. 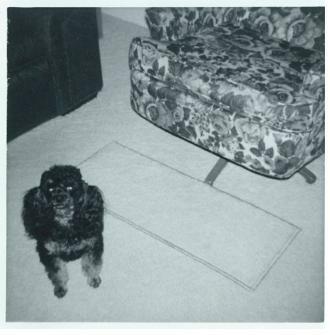 Holly would always follow her around, and as a puppy would lay on her feet when her mommy was doing dishes or cooking supper in the kitchen. Holly was supposed to be a silver toy, but she never completely changed over. That was very typical of Holly, she was definitely her own dog and didn't fit into any molds! As far as dog personalities went, Holly was one in a million! Very smart, intelligent and funny! She loved to play and liked to use my arm as a chew toy. Puppies teeth are razor sharp!! One time when she first came home, she was let outside to potty in the yard. She came up to the door to be let back in the house; I opened the screen door to let her in then closed the inside door. A few minutes went by, and we couldn't find Holly anywhere. I opened the door and there this tiny puppy was in between the door and screen door! She came into the house like nothing was wrong and soon forgot about that experience! At Christmas, Holly would be the first one up in the morning and would already have her gifts picked out of the pile of gifts. When we opened our gifts, she'd open hers with us. She always knew which gifts were hers and only opened those. Holly refused to wear a collar or go on a leash. 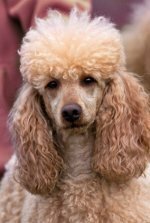 At the time we didn't know that toy poodle's have sensitive throats and a collar and leash can hurt their throats. She loved to walk up the alley with my mom to go to the mailbox and loved to explore things on the way. Holly didn't like dog food. We tried to give it to her as a puppy but she turned her nose up at it. She was fed either boiled hamburger or people food. She loved a tuna casserole my mom made except for the peas. Holly's plate would be licked clean except for the peas which would still be on her plate. Holly liked routine, especially at bedtime! If we were up later than usual in the living room watching TV, she'd pace around the living room and walk toward the bedroom! She was tired and wanted to go to bed and wanted us to go to bed, too! 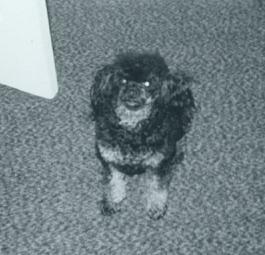 We have more toy poodle pictures of Holly and more of her story to share! You'll definitely want to read more about her great sense of humor and see more of her photos!